There are very few summer time treats that compare to juicy fresh peaches. 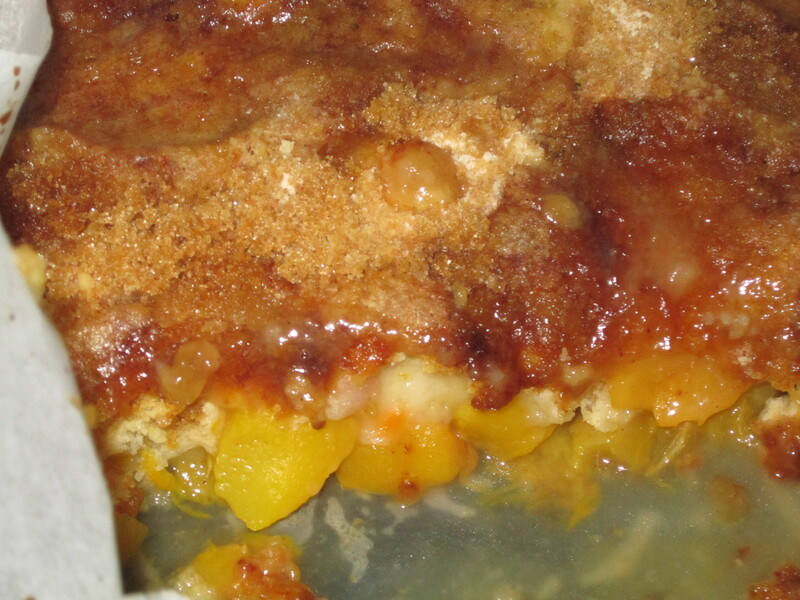 While I love fresh fruit on its own sometimes you just need to add sugar and transform it into a delicious dessert, fresh peaches go perfectly in cobbler served with ice cream. You may remember my Strawberry Cobbler post from a few months ago, this is essentially the same recipe, except I like yellow cake mix instead of white to go with the peaches. It’s incredibly easy, and amazingly yummy so do yourself a favor and make it this weekend! 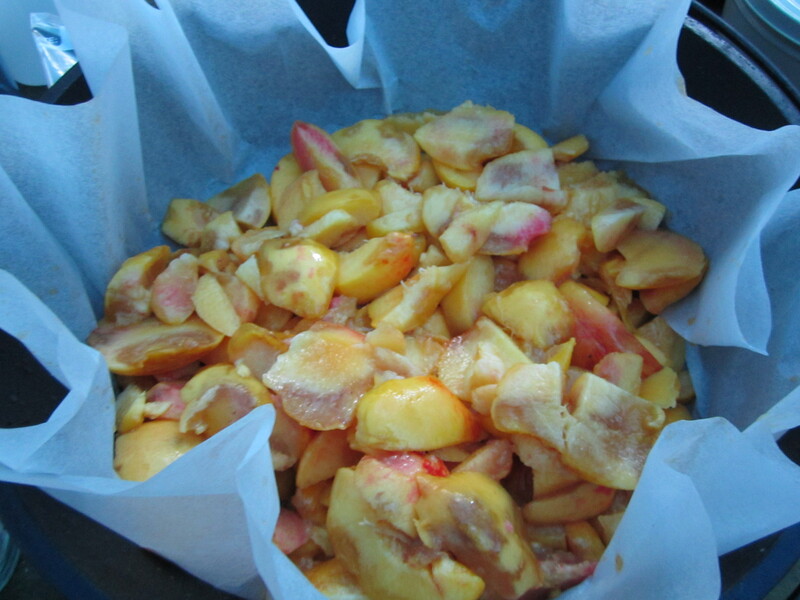 First peel and slice the peaches and place them in a lined dutch oven (if you don’t have liners you can use parchment paper). Then sprinkle them with cinnamon and brown sugar and the cake mix. Top with pats of butter (yum)! Put the lid on, add some charcoal to the top and bottom, and cook! Soooooo tangy and juicy and sweet and delicious! Serve it up in a big bowl and add ice cream if you so desire, it’s heavenly! It’s the perfect treat for a summer bonfire (or really, any summer event). 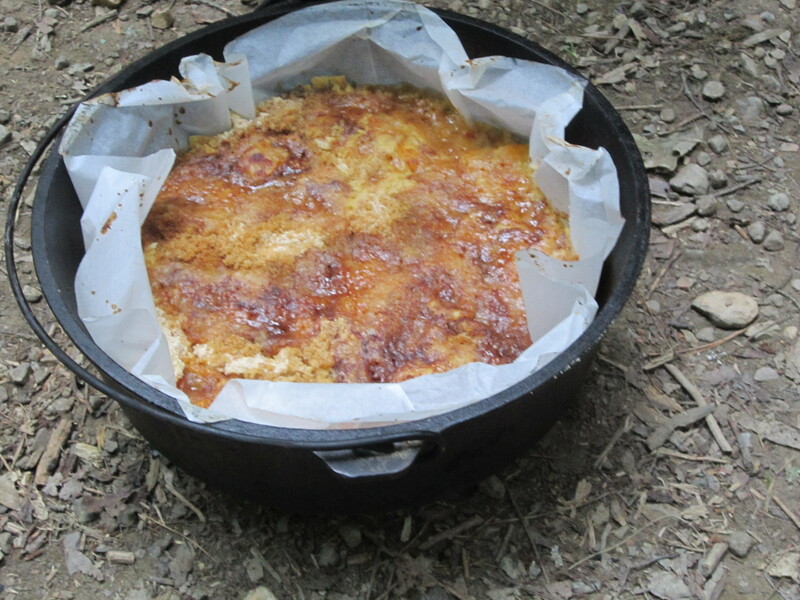 – If cooking outdoors: Place fire embers or charcoal briquets on a sheet of foil and place dutch oven on top (make sure the embers aren’t actually touching the bottom of the dutch oven as this will create hot spots and uneven cooking). Place more embers or charcoal briquets on the lid. Cook for 60-90 minutes (depending on heat), turning the oven 1/4 turn and the lid 1/4 turn in the opposite direction every 15 minutes until done. How big is your dutch oven? Looks like a 12 inch, but I could be wrong…I want to try this this weekend at the cabin! Yes, it’s a 12 inch, I hope you enjoy the cobbler, and be sure to let me know how it turns out! 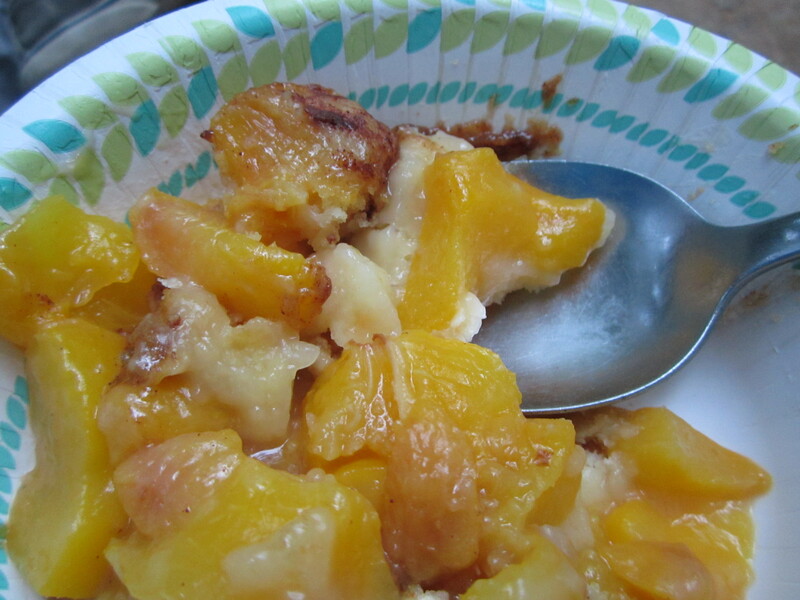 I plan on using white peaches, would you still use yellow cake mix or use white. I would use yellow but it doesn’t really matter either way, it will still turn out deliciously! What about using canned peaches? 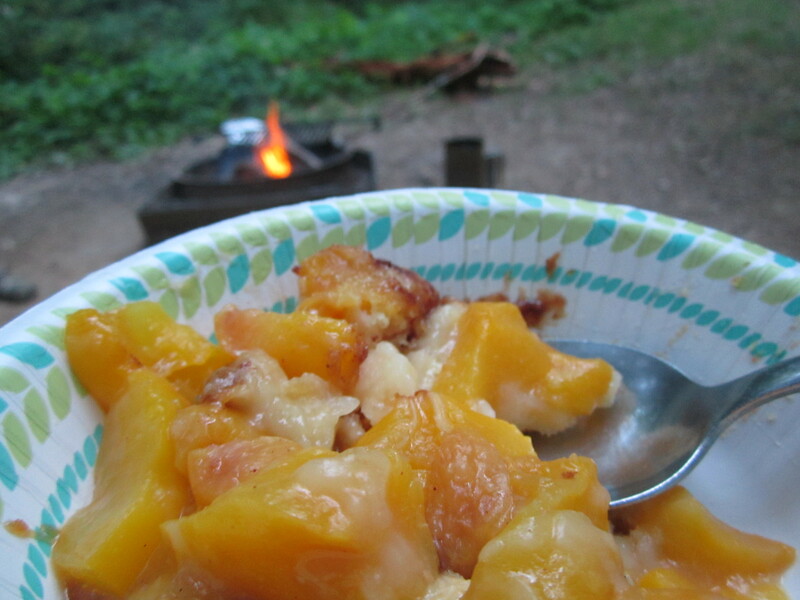 It’s not quite peach season here… Could I drain the peaches and then continue with the recipe? Definitely! I’ve used canned peaches before, but I leave a bit of the juice and continue on with the recipe as normal. 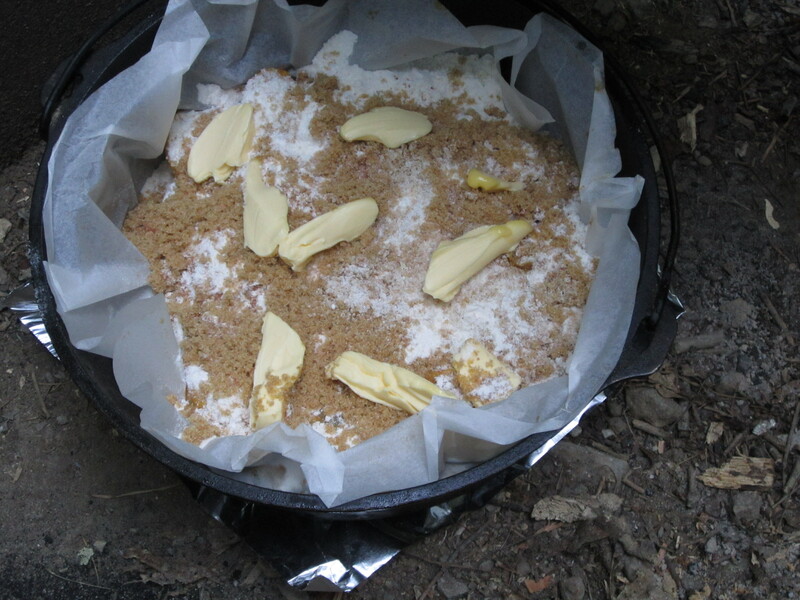 This is our first time using the Dutch oven, when you say to make sure the embers aren’t directly touching the bottom of the oven, how do we avoid that? 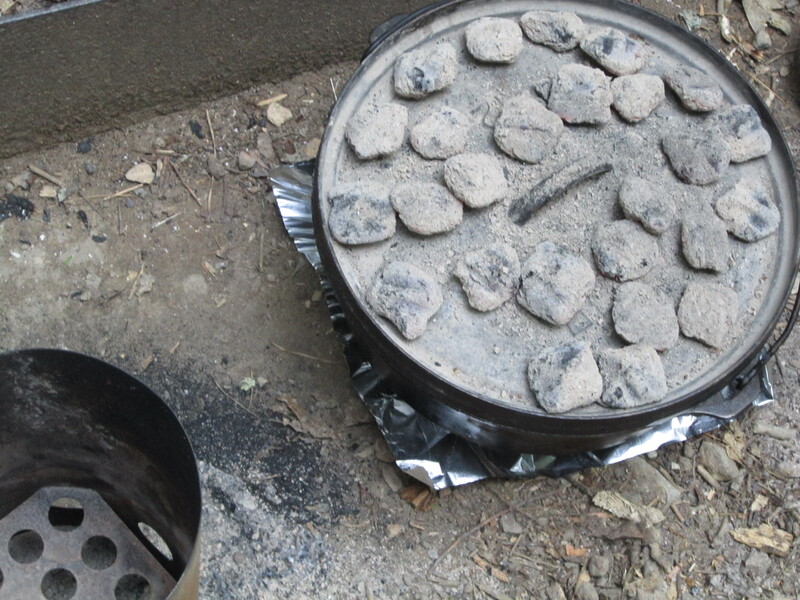 My dutch oven has legs on the bottom so I just make sure the coals aren’t higher than the legs. If yours doesn’t have legs I would maybe put it over a low grating.